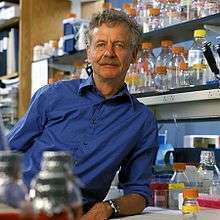 Rudolf Jaenisch (born 22 April 1942) is a Professor of Biology at MIT and a founding member of the Whitehead Institute for Biomedical Research. He is a pioneer of transgenic science, in which an animal’s genetic makeup is altered. Jaenisch has focused on creating genetically modified mice to study cancer and neurological diseases. Jaenisch’s first breakthrough occurred in 1974 when he and Beatrice Mintz showed that foreign DNA could be integrated into the DNA of early mouse embryos. They injected retrovirus DNA into early mouse embryos and showed that leukemia DNA sequences had integrated into the mouse genome and also to its offspring. These mice were the first transgenic mammals in history. His current research focuses on the epigenetic regulation of gene expression, which has led to major advances in creating embryonic stem cells and “induced pluripotent stem" (IPS) cells, as well as their therapeutic applications. In 2007, Jaenisch’s laboratory was one of the first three laboratories world-wide to report reprogramming cells taken from a mouse's tail into IPS cells. Jaenisch has since shown therapeutic benefits of IPS cell-based treatment for sickle-cell anemia and Parkinson's disease in mice. Additional research focuses on the epigenetic mechanisms involved in cancer and brain development. Jaenisch received his doctorate in medicine from the University of Munich in 1967, preferring the laboratory to the clinic. He became a postdoc at the Max Planck Institute in Munich, studying bacteriophages. He left Germany in 1970 for research positions at Princeton University, Fox Chase Institute for Cancer Research and the Salk Institute. He returned to Germany in 1977 to become the head of the Department of Tumor Virology at the Heinrich Pette Institute at the University of Hamburg. He arrived at MIT in 1984. He participated in the 2005 science conference on human cloning at the United Nations and serves on the science advisory boards of the Genetics Policy Institute and Stemgent. ↑ Li, E.; Bestor, T. H.; Jaenisch, R. (1992). "Targeted mutation of the DNA methyltransferase gene results in embryonic lethality". Cell. 69 (6): 915–926. doi:10.1016/0092-8674(92)90611-F. PMID 1606615. 1 2 "Rudolf Jaenisch". Whitehead Institute. Retrieved 17 September 2014. ↑ Jaenisch R, Mintz B (1974). "Simian virus 50 DNA sequences in DNA of healthy adult mice derived from preimplantation blastocysts injected with viral DNA". Proc. Natl. Acad. Sci. U.S.A. 71 (4): 1250–1254. doi:10.1073/pnas.71.4.1250. PMC 388203 . PMID 4364530. ↑ Brownlee, C. (2004). "Inaugural Article: Biography of Rudolf Jaenisch". Proceedings of the National Academy of Sciences. 101 (39): 13982–13984. doi:10.1073/pnas.0406416101. PMC 521108 . PMID 15383657. ↑ Jaenisch, R.; Bird, A. (2003). "Epigenetic regulation of gene expression: how the genome integrates intrinsic and environmental signals". Nature Genetics. 33 Suppl (3s): 245–254. doi:10.1038/ng1089. PMID 12610534. ↑ Levine, Aaron (2007). Cloning : a beginner's guide. Oxford: Oneworld. pp. 110–111, 162. ISBN 9781851685226. Retrieved 4 August 2015. ↑ Kumar, Seema (4 April 2001). "Jaenisch makes public case against human cloning". MIT News Office. Retrieved 17 September 2014. ↑ Jaenisch, R.; Wilmut, I (2001). "DEVELOPMENTAL BIOLOGY: Don't Clone Humans!". Science. 291 (5513): 2552. doi:10.1126/science.1060463. PMID 11286275. ↑ "Rudolf Jaenisch Featured Science Watch Newsletter Interview". ScienceWatch. March. 2009. Retrieved 4 August 2015. ↑ Fearer, Matt (27 September 2011). "Whitehead member, biology professor Rudolf Jaenisch wins National Medal of Science". MIT News Office. Retrieved 17 September 2014. ↑ "Advisory Board". Genetics Policy Institute. Genetics Policy Institute. Retrieved 14 September 2014. ↑ "Rudolf Jaenisch, M.D.". Stemgent. Retrieved 14 September 2014. ↑ "2001 Gruber Genetics Prize Press Release Rudolf Jaenisch, Gene Transfer Pioneer, Receives First-Ever International Genetics Prize". Gruber Foundation. 2001. Retrieved 4 August 2015. ↑ "NAS Membership Directory". U.S. National Academy of Sciences. Retrieved April 30, 2013. ↑ Bachtler, Barbara (December 1, 2006). "Professor Rudolf Jaenisch Receives Max Delbrück Medal". MDC News. Retrieved 4 August 2015. ↑ "The Vilcek Foundation -". www.vilcek.org. Retrieved 2015-11-11. ↑ "Ernst Schering Prize". Ernst Schering Foundation. Retrieved 4 August 2015. ↑ "The President's National Medal of Science". National Science Foundation. Retrieved 17 September 2014. ↑ "Rudolf Jaenisch Winner of Wolf Prize in Medicine - 2011". Wolf Foundation. Retrieved 17 September 2014. ↑ "2013 Benjamin Franklin Medal in Life Science presented to Rudolf Jaenisch". Journal of the Franklin Institute. 352 (7): 2587–2590. 2015. doi:10.1016/j.jfranklin.2015.03.004. Retrieved 4 August 2015.